For those who give importance to the high quality "Made in Germany", the series ZWILLING PRO is the best choice. Both for professionals and for those who love cooking: knives ZWILLING PRO is the perfect combination of innovation, traditional design and absolute precision. By Paring knife Santoku, this series offers blades suitable for all uses in the kitchen. A collection to meet all needs in a modern kitchen: a great quality and a perfect line. The unique composition of the steel ZWILLING JA HENCKELS is the perfect balance of chromium and carbon: the secret to a high-quality steel. The knives with brand FRIODUR are the product of a special hardener cryogenic treatment that improves the quality. They have exceptional cutting, are especially corrosion-resistant and flexible. The clean blade over the entire length allows to cut from the tip up to the node. The type of sharpening satisfies both the tradition of cutting European and Japanese. The knives with the brand SIGMAFORGE are obtained by precision forging starting from a single piece of steel, for a perfect geometry. The basic requirement for sharpness and precision for the best cutting properties. The wedge-shaped geometry of the blade enables an extraordinary stability and an easy cut; the curved shape of the node ensures reliable and accurate. A classic for the professional kitchen. The 3-rivet design with tang seamless stands for perfect balance. Global - G Series Herb Chopper 18cm/7"
Global - G Series Herb Chopper 18cm/7" The Global Hachoir Mincing Knife chops and minces herbs and vegetables effortlessly with a rocking motion. The curved-shape of the blade allows to cut without lifting the knife from the cutting board. The Global blade is made from one of the finest steels, Cromova 18 stainless steel. This special steel is ice-tempered and hardened to a Rockwell Hardness of 56-58, which remains razor sharp longer than any other steel and resists rust, stains and corrosion. To balance the blade, the unique hollow handle is filled with the right amount of sand to create the perfect balance. Made in Japan with a lifetime warranty. - Length: 18cm - Clean immediately after use, do not leave deposits of food on the knife blades. - Hand wash only in mild soapy water, rinse thoroughly and dry immediately. - Please do not put in the dishwasher as exposure to extreme heat and powerful detergents can be harmful to CROMOVA 18, and the blade can be damaged if contact is made with other objects. For the trend-setting Shun Premier Tim Mälzer series, Kai has developed six additional knives made from corrosion-resistant 32-layer damask steel. It is embellished with a hand-hammered surface which in Japan is known as Tsuchime, thus combining timeless aesthetic qualities with ultimate sharpness. The blades have a massive core of VG MAX steel with a hardness of 61±1 HRC. In analogy to the limited Anniversary Knife, great importance was attached also in this series to the knives providing optimum grip as well as extraordinary hardness. The Shun Premier Tim Mälzer series, from bread knife to santoku, provides professional cutting tools which will set new standards in the premium segment by providing exceptional performance in a timeless design. True to Tim Mälzer‘s premise, „A good knife not only makes work easier but also helps to make cooking to turn out well“, each of the carefully manufactured damask knives was meticulously adapted to its respective area of use by the Japanese master forgers from Seki City. Due to the particularly symmetrical shape of their walnut handle, all shapes moreover ensure a precise cutting performance for both right-handed as well as left-handed use. "...quando ho pensato alla creazione di questa nuova serie di coltelli, ho pensato che dovevano essere sì belli da vedere, sì piacevoli da stringere nel palmo della mano, ma soprattutto dovevano essere utili, versatili e funzionali nelle operazioni da cucina. Il coltello deve essere un compagno di lavoro per ogni piccolo, grande chef affinché possa condividere il piacere quotidiano di tagliare, incidere, disossare o mondare qualsiasi ingrediente." La confezione Box deluxe è composta da: TRINCIANTE (CUCINA): lama versatile per tagliare, affettare e triturare. DISOSSO: lama per disossare pollo, prosciutto e ritagliare grasso e tendini. SALUMI: lama per tagliare salami. ARROSTI: lama adatta per affettare. ACCIAINO: affilatorio in acciaio speciale per riaffilare le vostre lame. I coltelli giapponesi della GLOBAL sono i preferiti dagli Chefs nei più prestigiosi hotel e ristoranti del mondo. Il primo GLOBAL knife fu disegnato nel 1985 da Komin Yamada, il quale diede al coltello da lui creato un design nuovo e rivoluzionario . - Leggerezza: la GLOBAL è stata la prima azienda al mondo a realizzare un coltello in acciaio vuoto nel manico. Questa caratteristica, permette di ridurre il peso del coltello del 30%. - Maneggevolezza: grazie alla leggerezza e alla forma anatomica del manico, i coltelli GLOBAL si prestano a continuativi e prolungati tempi d'impiego, riducendo al massimo l'affaticamento dell'utilizzatore. - Tenuta del filo: I coltelli GLOBAL sono realizzati utilizzando i migliori acciai e le più moderne tecniche di lavorazione. Nelle lame è presente in alta percentuale il Molibdeno/Vanadio grazie al quale la durezza dell'acciaio raggiunge i 56/58 Rockwell di durezza, aumentando di conseguenza la durata del filo. - Robustezza: essendo i coltelli GLOBAL completamente in acciaio (sia il manico che la lama) sono praticamente indistruttibili. 1996 - Selected as Sharpest Knife by A LA CARTE Magazine in GermanyI coltelli giapponesi della GLOBAL sono i preferiti dagli Chefs nei più prestigiosi hotel e ristoranti del mondo. Kai Japan - Shun Nagare NDC-0700 Coreless Steel - Classic 90mm sponge. With Shun Nagare, Kai created another innovative Japanese forging masterpiece. This series of fine-knotted knives, thanks to the special features of the materials and the technically complex production process they are made, is located in the extralusso class. Mirrored blades have a damask damask pattern. The dark gray-black handle further enhances the beauty of the knife. The blades of this series are made with two different qualities of steel, bonded to form a 72-layer Damascus steel. The complex machining of the two steel grades produces a blade with exceptionally long lasting cutting performance. Kai Japan - Shun Nagare NDC-0702 Coreless Steel - Santoku knife 180mm. Kai Japan - Shun Nagare NDC-0706 Coreless Steel - Chef knife 200mm. Viper's Sakura Knives, designed by Jens Anso and Jesper Voxnaes, are a modern interpretation of the classic kitchen knife. Featuring a hardening with a subsequent cryogenic finish to provide the best cutting and sealing properties, they have gorgeous Bocote Hot Wood Handles that adds character and sophistication to design. Takefu Knives Village is a brand born in 1991 in Echizen Fukui, Japan's famous city since the 1400s for knives production. The Takefu knives brand is based on the union of 10 local artisans who make every knife by hand. Kanehiro-san knives have gained popularity among professional chefs for the highest construction level and the high performance and cutting performance. Blade: CladSteel carbon steel with 62 / 64HRC White Paper Steel (Shirogami) cutting edge and 33-layer Damask "Suminagashi"
He was born in 1950 and is the 3rd generation of Kitaoka Hamono. He has been a specialist of Kataba (single-beveled) knife from the beginning. He is also Dentoukougeishi. Takefu Knives Village is a brand born in 1991 in Echizen Fukui, a city in Japan famous since 1400 for the production of knives. Born in the city of Echizen in 1950, third generation forging craftsmen, he specializes in knives with Kataba blade (concave blade on the left side of the wire, chisel blade on the right side of the wire) also receiving the title of Dentoukougeishi (traditional craftsman) after subjected to the strict examination of the Traditional Crafts Industry Promotion Association Foundation commission. Its knives are made with a White Paper Steel (Shirogami) cutting edge with a hardness of over 62 / 64HRC and with "Suminagashi" damask steel laminated cheeks. The handles are made as usual in sandalwood and Asian buffalo horn. Given the high carbon content steel used for the blade and the extreme build quality of these knives, we recommend a series of attentions to follow to maintain the quality of the product over time. - Pay attention that the cutting edge of the knife does not come into contact with other metal objects during its deposit to avoid damage to the cutting edge. Use: Ideal for cutting and portioning vegetables, slicing raw meat or cleaning the fish. - Lightweight: GLOBAL was the first company worldwide to produce a empty steel knife in the handle. This feature allows to reduce the weight of 30% knife. - Handling: thanks to the lightness and the anatomical shape of the handle, the GLOBAL knives lend themselves to continuous and prolonged operating times, reducing to a maximum the user's fatigue. - the wire seal: The GLOBAL knives are made using the best steels and the most modern processing techniques. In the blades it is present in high percentage Molybdenum / Vanadium thanks to which the hardness of the steel reaches 56/58 Rockwell hardness, thereby increasing the length of the wire. - Robustness: the GLOBAL knives being completely steel (both the handle that the blade) are virtually indestructible. 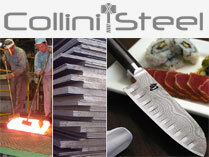 Global All products we sell are screen printed indelibly with the Collini Cutlery logo (see picture). Such marking warrants to be sure about the quality, traceability, security over the years and a future prime care product purchased at the Collini Cutlery. Use: Ideal for cleaning lightly fish, raw meat, vegetables and for any cut where it is required the utmost precision. Already back in 1100 expert Japanese forgers combined different materials to confer superior and unprecedented cutting potential potential, resistance and flexibility upon Katana swords. Inspired by this tradition, Berkel has created its own series of Japanese SanMai steel knives. The blade consists of a central layer of extremely hard VG-10 steel, which maintains sharpness over a long time, and two outer sheets in stainless damascus steel, with 33 layers per side, for greater resistance to corrosion and torsion. Grip: Consists of two scales assembled with aluminium rivets. Grip: Consists of two scales assembled with aluminum rivets. Utility knife belonging to Kitchen Surfer line, a joker can be used for many different preparations as meat, vegetables, fruit. - Blade of 12 cm, total length of 22.5 cm. Weight: 72 gr. With its special blade shape, the new Kitchen Surfer from WÜSTHOF is the perfect all-rounder for all cutting tasks in the kitchen or at the table. Made from a single piece of chromium-molybdenum-vanadium blade steel, it offers outstanding sharpness and edge retention thanks to the special laser-controlled PEtec sharpening process. The handles made of robust plastic are welded and riveted without any joints. The bolster and continuous tang ensure the right weight and good balance. Available at a reason price, versatile and long-lasting, what more could you ask for! A jewel multifunctional kitchen, PRIMITIVE much more of a pure object from the collection. Its natural ergonomics enhances manual dexterity, the pleasure of controlling the quality of cut, to affect with speed and precision. Primitive perfect for filleting fish, to prepare a julienne of vegetables, to cut a chicken. A companion multi-purpose, designed for those who love cooking and for those who work in the kitchen. Knife designed by the Italian Michele Daneluzzo who took inspiration from the tools used by early humans. The tool consists of a piece of steel petal-shaped, reminiscent of the stone 'flint' used by men nell'et the stone to cut and hunt. The product is packaged in a gift box with inserted inside also support-Stand for the knife. Also available upon request in the polished version. Kitchen Set 38157-001 Twin® Grip USEFUL AIDS FOR EVERY OCCASION! Content: 38186-060 potato peeler 38601-090 paring knife cm 9 blade length 41373-000 kitchen scissors. Stainless steel. Packaging: cardboard box. Un coltello sviluppato principalmente per tagliare verdure. I coltelli giapponesi della GLOBAL sono i preferiti dagli Chefs nei più prestigiosi hotel e ristoranti del mondo.Il primo GLOBAL knife fu disegnato nel 1985 da Komin Yamada, il quale diede al coltello da lui creato un design nuovo e rivoluzionario. Il set è composto dal modello FK075 , modello FK140e e il tagliere in bamboo in regalo. Sharpening: A three phases, styled "Honbazuke"
Surface finish: Hammering mirror polished style "Tsuchime"
The Handles: made of synthetic material and joined together with a triple riveting ensuring a perfect fit, excellent stability and guarantee the dishwasher. The Blades are obtained using the best steel and combining the most qualified elements (chromium 15% - 0.5% carbon - molybdenum - vanadium). The realization of a knife forged WUSTHOF involves the passage of about 40 cycles. - Please make sure to put the knives in a dishwasher from hitting other objects as this may damage the blades. - The knives guaranteed for dishwashers that are not immediately washed in the machine should be rinsed under the tap water to remove the remains of the highly corrosive foods (fats, vinegar, fruit juices). - Not sure if the knives were more cut to perfection, corrections or sharpen by professionals in the field. The Wusthof knives sold by us, are personally inspected and further sharpened in order to guarantee you the certainty of a good buy. Wusthof All products we sell are screen printed indelibly with the logo of Collini Cutlery (see picture). The CE marking means the buyer to be sure of the quality, traceability, warranty assistance over the years and a future prime product purchased at the Collini Cutlery. A knife developed primarily for cutting vegetables. Knife all do for meat, vegetables and small fish. The line Premana Professional Knives Sanelli was made by analyzing and solving, in every detail, the problems that present themselves to the professional, private or impassioned closer who uses these working tools every day. Use: a new proposal from Sanelli, a joker knife used on meats and vegetables for all the daily preparations. Kyocera Ishi Ba sostiene le attività di Prevenzione della Lega Italiana per la Lotta Contro i Tumori. - Lama in ceramica Ishi-Ba nera di 14 cm. The Premana Professional line by Sanelli was made by analyzing and solving, in every detail, the problems that present themselves to the professional, private or impassioned who use these working tools every day. No kitchen should be without this manual food processor. It is the most essential of all knives used in the kitchen. Slicing, mincing, dicing of all kind of food. Perfectly balanced, an extension of your hand. Extra wide. Precision forged from a single blank of steel with bolster and full tang. Ergonomic handle design developed in consultation with professional chefs. Full bolster/finger guard for safety and protection. Caution: cook´s knives purposely have been ground extra thin for the ultimate cutting performance. Chopping through bones will damage the fine edge. The Opinel Essentials. Or, as they say in France, "Les Essentiels du Cuisinier". This edit is all about the best quality, easiest to use knives and this is a selection of Opinel's finest kitchen knives. It is a fantastic gift for anyone starting out in the kitchen, moving into a new home, or a self-gift if you are simply fed up of chasing those tomatoes round the board and want something sharp that stays that way. These three knives and a peeler will cover off pretty much any kitchen task. From peeling potatoes, to prepping fruit and vegetables, to trimming, dicing and slicing. Lightweight and easy to use - the culinary equivalent of the little black dress. The kit contains: - Paring knife no. 112 (couteau d'office) - Serrated knife no. 113 (couteau creante) - Vegetable knife no. 114 (couteau a legumes) - Vegetable Peeler no.115 (eplucher a legumes - can be used left or right handed) The kits come in three colour ways: the classic wooden beech handles, shades of green, or a grey-black-red-white version. Stainless steel blades and dishwasher safe. - Lama in ceramica Ishi-Ba di 14 cm. Two knives rounder, ideal for cutting vegetables, fruits and meat. The Handles: made of synthetic material and joined together with a triple riveting ensuring a perfect fit , excellent stability and guarantee the dishwasher . The Blades are obtained using the best steel and combining the most qualified elements ( chromium 15% - 0.5% carbon - molybdenum - vanadium ) . - Please make sure to put the knives in a dishwasher from hitting other objects as this may damage the blades . - The knives guaranteed for dishwashers that are not immediately washed in the machine should be rinsed under the tap water to remove the remains of the highly corrosive foods (fats , vinegar, fruit juices) . - Not sure if the knives were more cut to perfection, corrections or sharpen by professionals in the field . The Wusthof knives sold by us, are carefully checked and if necessary further sharp in our laboratory , in order to guarantee you the certainty of a good buy . Wusthof All products we sell are screen printed indelibly with the logo of Coltelleria Collini (see picture) . The CE marking means the buyer to be sure of the quality, traceability , warranty assistance over the years and a future prime product purchased at the Coltelleria Collini. Knife all do in the kitchen, from the cutting of vegetables to the cutting of meat, with the possibility of splitting tiny bones using the lower part of the blade, where the wire is more robust. Winner of the prestigious and international Good Design Award 2001 for the originality of its design and functionality. We strongly recommend NOT to wash in the dishwasher. LINE KYO FINE BLACK The series Kyo End Black combines the characteristics of the family Kyo End - the ergonomic handle, the rounded tip and the new ceramic - the charm and elegance of the black blade. A further step of sintering makes these blades are even more resistant. Questi coltelli si caratterizzano per l'ottima qualità e purezza dell'acciaioinox impiegato che garantisce un taglio preciso e sottile unito aduna buona durata del filo. Le impugnature in Fibrox garantiscono inoltre unapresa sicura e confortevole unita alla massima igiene. SEKI MAGOROKU, the traditional Japanese knives, since centuries are manufactured in similar shape. On top some European types of blades have been added as well. This series bribes through its bright polished blade made of top quality steel with 58 +/- 1 HRC hardness and through the finest polished grinding which provides the series with a high cutting performance. RED WOOD: The traditionally chestnut shaped handle is made of Red-Wood. This hardwood is highly oil containing by nature and therefore water resistant. The correct name for this Japanese model is Usuba; It is characterized by the asymmetric bevelling suitable for right-handed. TACTICAL KNIVES MEET THE KITCHEN! Extrema Ratio is delighted to apply the strict military standards to a range of professional kitchen knives. The steel blade is the proven BOHLER N690, a steel enriched with chrome, vanadium, molybdenum and cobalt, hardened to the hardness of 58HRC. The handle is made of Forprene, an elastomer that is in the "NATO standard" for resistance to extreme conditions, and is completely removable from the blade; this makes possible a thorough cleaning and maintenance of the knife. Each knife comes with its own sheath, also of military origin, which does not take into account the rules of hygiene but ensures safe transport dell'affilatissima blade and protection from shocks that could reduce efficiency. We recommend to use it only for the transport and in the event of long periods of inactivity. The number of Hybrid Mcusta is made with a steel blade VG10 combined with a beautiful and extremely comfortable handle in wood Pakkawood black. All knives are accompagniati an elegant lacquered wooden blade cover that protects and preserves the blade. The Santoku knife is the traditional Japanese cooking knife with which you can do everything from cutting vegetables to the meat and fish. In this version, slightly modified compared to the traditional design , the hollow indents in the blade allow food to slide right off without sticking. Also works well when dicing onions or other vegetables. - Blade of 17 cm ( total length . 30cm ) , weight 172 gr. The Handles: made of synthetic material and joined together with a triple riveting ensuring a perfect fit , excellent stability and guarantee the dishwasher. The Blades: are obtained by using the best steel and combining the most qualified elements ( chromium 15% - 0.5% carbon - molybdenum - vanadium ) . - Please make sure to put the knives in a dishwasher from hitting other objects could damage the blades . - The knives guaranteed for dishwashers that are not immediately washed in the machine should be rinsed under tap water to remove the remnants of the highly corrosive foods (fats , vinegar, fruit juices) . - Make sure if the knives do not cut more perfectly, to have them corrected or sharpened by professionals in the field . WUSTHOF knives sold by us, are personally inspected and further sharpened in order to guarantee you are assured of a great purchase. The innovative series Seki Magoroku Composite has 8 types of symmetrical blades. The blade, beautifully finished, the union of two different types of steel that create a fascinating contrast. The central part of the blade, polished, stainless steel is VG-MAX with a hardness of 61 ± 1 HRC, while the exterior is satin steel SUS420J2 to altissio chromium content. The production process of the blades Composite is based on a new technology used in aircraft construction and ensures a high resistance over that extreme precision. The two types of steel are joined together by one particular welding process to the copper, and the thin line of copper that remains visible between the two steels adds a further touch of elegance to the design. The grip is tapered in a light shade of pakkawood. The shape of the reason diagonally give these masterpieces lightness and movement. Mini Santoku with alveoli, ideal for cutting of any food (fish, meat or vegetables). Knife do everything in the kitchen, from the cutting of vegetables to the cutting of meat, with the possibility of splitting small ossicles using the lower part of the blade, where the wire is more robust. Two knives rounder , ideal for cutting vegetables, fruit and meat. - santoku knife 4183/17 - length . the blade 17 cm - length . tot . 29.5 cm - Weight: 164 gr. - paring for vegetables 4000/8 - length . blade 8 cm - length . tot . 18 cm - Weight: 60 gr. Questo coltello giapponese con lama in ossido di zirconio di 75mm, un ottimo strumento per la carne e la verdura grazie alle sue dimensioni e alle sue eccelse capacita' di taglio e di praticita', conferita anche dalla nuova impugnatura ergonomica antiscivolo in polimeri termoplastici. - Lama in ceramica Ishi-Ba di 7,5 cm. Questo coltello giapponese con lama in ossido di zirconio di 110mm, un ottimo strumento per la carne e la verdura grazie alle sue dimensioni e alle sue eccelse capacita' di taglio e di praticita', conferita anche dalla nuova impugnatura ergonomica antiscivolo in polimeri termoplastici. - Lama in ceramica Ishi-Ba di 11 cm. Il set è composto dal modello FK075 e dal modello FK140. The line Premana Professional Knives Sanelli was carried out by analyzing and solving every detail, the problems that arise to the trader, private or impassioned more careful using these tools daily work. Very nice set of knives with ceramic blade and finely hand-decorated with elegant handle in china . Ceramics produced , worked and decorated entirely in the city of Tajimi one of the homelands of the modern ceramic art in Japan. - Weight : 146gr . - Weight : 95gr . The Opinel Essentials. Or, as they say in France, "Les Essentiels du Cuisinier". This edit is all about the best quality, easiest to use knives and this is a selection of Opinel's finest kitchen knives. It is a fantastic gift for anyone starting out in the kitchen, moving into a new home, or a self-gift if you are simply fed up of chasing those tomatoes round the board and want something sharp that stays that way. These three knives and a peeler will cover off pretty much any kitchen task. From peeling potatoes, to prepping fruit and vegetables, to trimming, dicing and slicing. Lightweight and easy to use - the culinary equivalent of the little black dress. The kit contains: - Paring knife no. 112 (couteau d'office) - Serrated knife no. 113 (couteau creante) - Vegetable knife no. 114 (couteau a legumes) - Vegetable Peeler no.115 (eplucher a legumes - can be used left or right handed) The kits come in the classic wooden beech handles. Stainless steel blades and dishwasher safe. Knife do everything in the kitchen, ideal for cutting vegetables, fruit and meat small size. - Weight : 76gr . - Weight : 122gr . Uso: E’ un coltello molto versatile, di misura media. È adatto per pelare, tagliare, lardellare e guarnire. Solo un oggetto che non ci stanchiamo mai di guardare e di cui non possiamopiù fare a meno è destinato a diventare un classico. Classico e familiare ma, al tempo stesso, innovativo e funzionale senza compromessi. Ecco come l’associazione tra materiali esclusivi e tecnologie all’avanguardia trasforma l’uso di questo coltello in un’esperienza emotiva. L’acciaio ad alta prestazione Cronidur 30, già sperimentato in aviazione e nella tecnologia spaziale, garantisce affilatura durevole, resistenza alla corrosione e stabilità della lama. Forgiato con precisione a partire da un unico blocco e temprato nel ghiaccio, questo coltello è un autentico prodotto SIGMAFORGE. Il manico in ebano naturale lucidato ad olio rende unico lo stile di questo coltello. TWIN 1731 è un coltello dalle linee essenziali, prodotto interamente con materiali naturali, piacevoli al tatto; è il coltello che vorrete avere sempre a portata di mano e di cui non potrete più fare a meno. TWIN 1731 è stato progettato per ZWILLING J.A. HENCKELS dall’architetto Matteo Thun, designer di fama internazionale che svolge la sua attività a Milano. Il suo design coniuga la praticità con l’innovazione, focalizzandosi su forma e funzione. Il risultato è un coltello nella sua pura essenza. La forma deriva dalla funzione; la funzione deriva dall’immagine e l’immagine dalla realtà. Il risultato è la bellezza. Un coltello nella sua forma più pura: TWIN 1731. Economico e versatile coltello da cucina.